Planning aid schemes provide free and independent planning advice to groups or individuals who cannot afford to employ a consultant. They give people the knowledge, skills and confidence to deal with the planning system and to become involved with wider planning issues. 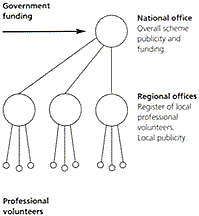 Planning aid schemes are normally set up and run by national or regional professional institutions. A register of qualified professional planners prepared to volunteer their time is established. People needing help are put in touch with the nearest suitable volunteer on the register. The volunteer assists as much as possible, referring queries to the authorities or consultants if appropriate. As schemes become well established they may employ paid workers, establish telephone helplines, produce publications and become more pro-active in encouraging community participation. The scheme is coordinated by the national office of a professional institution. Regional branches publicise the scheme locally and maintain registers of professional planners willing to work in a voluntary capacity. Government grant assistance is useful for setting up and administering planning aid systems. Producing information sheets on the planning system and common problems and issues can make the volunteer's job much easier. Need not be restricted to planners. 'Architectural aid', 'Surveying aid' and so on can also be very valuable. Setting-up costs: administration in compiling register; distributing publicity material. Ongoing costs: dealing with enquiries. Opportunity to take part in a wide range of activities including environmental education. Satisfaction in helping people participate in the development of their communities. Useful source of continuing professional development. Valuable insight into the planning system from a user's point of view. Appealing against a refusal of planning permission. Appearing at a public inquiry. Drawing up community plans and local design statements. Guidance on development proposals and specific site problems. How the planning system works. How to find information and contact the right people. Objecting to or supporting a planning application or planning appeal. Putting forward your own views when local plans are being prepared. The rights of an individual or group on planning matters. The need for planning permission. Understanding the many types of development plans. Using the most effective public participation methods.